[Grrr...] Is Tech Support Designed to Enrage You? Do You Have Tech Support Rage? This condition even has a name among mental health professionals: “tech support rage.” And in many cases, it's also quite deliberately induced by the companies you call for tech support. There’s an old proverb: “Never attribute to malice what is adequately explained by stupidity.” But the companies that design devilish tech support systems are not stupid; they know exactly what they’re doing and what effects it has on customers. They analyze every call to see what buttons you press, how long you wait on hold, and what you say to the interactive voice response system, including the naughty words. They seek, quite successfully, to strike an optimal balance between losing customers and avoiding the unprofitable expense of talking to them. Then, if you persist and finally get a live human being on the line, “the system” is designed to make your interaction with him or her as painful and unhelpful as possible. In 2014, the International Customer Management Institute (ICMI), conducted a survey of its members, all customer service managers. It found that 92% of them think their agents could be more effective, and 74% said their companies’ procedures prevented agents from being more effective. That bears repeating: three out of four customer service managers say their companies’ carefully designed and precisely documented procedures prevent you from getting satisfaction. They are well aware of it, and no one is doing anything to change those policies. Why is Tech Support So Frustrating? The reason is “money,” of course. Most tech support is provided free of charge, so companies want to provide as little of it as possible. Rather than make products that work as advertised, are easy to figure out, and don’t break, they do all they can to make customers go away with their problems. In my experience, this treatment isn't limited to the world of computers and tech gadgets. Just yesterday I called Sears, wanting to schedule a service appointment for our broken dishwasher. Even though we have a pre-paid service contract, the rep started asking ridiculous questions, in an attempt to "help me" diagnose and fix the problem myself. He then put me on hold, allegedly to find the service manual, and when he returned, he offered to email me some helpful do-it-yourself instructions. No thanks, I'm not going to stick my head in there and fiddle with the whatchamacallits. Just send a technician, please! I eventually got so frustrated that I hung up on the guy. Which is probably just what they wanted me to do. I called back, and got a different rep. And oddly, he was amazingly friendly and helpful. My service visit was scheduled right away. But the cynic in me thinks this is all part of a plan to minimize the expense of sending techs on service calls. This strategy works best when customers cannot switch to another company. Unsurprisingly, the ICMI survey found that managers in monopolistic markets, such as cable TV or public utilities, reported “agents could be more effective” and “procedures prevent agents from being more effective” at much higher rates than managers in competitive markets. Startups are also more eager to please than incumbents, as anyone who has dealt with a big company and a newcomer can confirm. If you persist and finally get a live human being on the line, don’t expect him or her to solve your problem. The first person you speak with probably knows less about the product and its vagaries than you do. The ICMI survey also found that 73% of managers report tech support calls are getting “more complicated,” as customers are increasingly sophisticated and solve simpler issues on their own (or with the help of online forums and sites such as mine). The “procedures” that companies inculcate into customer service agents emphasize minimizing phone time with each customer, not solving problems. So when your call approaches the magic two-minute mark, you are going to be put on “terminal hold” while the agent moves on to other calls, or transferred to “escalated” support to wait forever for someone who actually knows the product. Who wouldn’t totally lose his temper after an hour of such treatment? It’s deliberate, it’s cunningly contrived, and it’s pervasive throughout the customer support industry, as the ICMI’s own survey conclusively proves. It’s not just you. There are exception to this dastardly convention. Amazon’s customer service reps get high marks for actually solving problems, and doing it swiftly and efficiently. They are empowered to do things for customers like send out a replacement product immediately, or issue a refund. I've also had consistently good experiences over the years with Verizon tech support, for both billing and technical issues. But in most cases, when you call tech support for a large company, you are going to be driven to the verge of murder. So be prepared. Do whatever it takes to avoid losing your temper with an agent; that won’t get your problem solved, it will just get you put on terminal hold faster. Take a deep breath. Meditate. Take a chill pill (or something stronger if you have a prescription). Moreover, you can actually get an agent to work for you if you try honey instead of vinegar. Remember the agent’s name and use it often; this establishes a personal relationship, and most agents are starved for personal recognition. Try (and I know it’s hard) to find some humor in the situation. If you can make an agent laugh, which he or she probably hasn’t done since accepting the job of “tech support agent,” you’ll get the best service that canned scripts and limited authority can provide. It’s better than terminal hold. Here’s an idea for avoiding the hell of navigating those interactive voice response (IVR) systems: use social media to contact tech support. Posting your plea for help on a company’s Twitter feed or Facebook account may well get attention much faster than a phone call, and at least you’re not waiting on hold until attention is paid. Another tactic is to choose the voice-menu option for “sales” or “place an order” instead of “technical support.” Those callers are answered faster because they mean money. They’re usually answered by people in your country, too, while tech support calls are answered by foreigners in who-knows-where. You can also consult sites such as DialAHuman.com and GetHuman.com, which are repositories for the collective knowledge of many customers. They include tips for navigating specific companies’ IVRs as painlessly as possible, and direct phone numbers of key customer service staffers at many companies. Another option is FastCustomer http://www.fastcustomer.com, which eliminates waiting on hold. You place a request for support, hang up, and then wait for the rep to call you. The Internet: How Does it Work? [FIN] Is This the End of Siri and Alexa? What's in The Deep, Dark Web? What's in the 2017 Internet Trends Report? Most recent comments on "[Grrr...] Is Tech Support Designed to Enrage You?" Apple is frustrating -- they're so nice & will chat for hours via Chat or on the phone. But they don't have a Support mindset. Usuallly, the first 10 minutes of any communication is spent telling me that their products are invincible and nothing's wrong. The really sad thing is that the Apple Store SHOULD be on the alert for early clues of bigger problems. But because the employees have been trained to believe that problems with Apple products are as likely as winning the Mega-Lotto (and that all will be well after a phone firmware reset), they don't take notes nor tell each other about what they're seeing -- or post useful information on their website to help customers avoid tech support. I use Ting for cell phone service and they have the BEST customer service I have ever encountered. Real people who know their stuff. And one agent called me on a Sunday in response to an email I had sent (even though it wasn't an emergency situation for me) because he thought I shouldn't be phoneless over a weekend! The Blondie cartoon is very accurate. All too frequently I encounter support people who have no knowledge at all about their products. They follow a pre-written script. If they get interrupted somewhere down the list, they have to start all over with the first item. The last item on the list is “We are aware of the problem and will have it fixed shortly”. I’m a natural troubleshooter. I gather all the information I can before contacting the non-support people. Unfortunately, most of these people have no clue what to do with the information. For example, I was having a problem with my Internet connection. I did a tracert to find where the problem was. After 6 contacts (via e-mail/chat – I gave up on the automated phone system years ago*) over a 2 month period, I managed to get someone who asked me to send the tracert, which I did. The person was quite honest in saying she didn’t understand any of it, but sent it to the technical department anyway. Two days later the problem was fixed. None of the other reps knew what to do with the information provided – it wasn’t on their checklist/script. Automated phone systems, technical/customer/member support/service people are a company’s firewall to protect them from the customers. If a customer can somehow manage to get through the firewall, to someone who knows the product/service, it can be resolved quite quickly. I am reminded of a cartoon I saw about 20 years ago. It showed a person telling a customer: I don’t know how you did it, but you reached someone who can handle your problem on the first try. Please hand up and call back. Even though I can somewhat understand a company setting up a customer firewall, there is no excuse for untrained people handling the “help” desk. Knowing the product or system, and knowing who handles what type problem should be basic requirements for employment, or included in personnel training. However, with over 20-years’ experience I find this to be a very rare occurrence. * I do not like having to call a company several times to find how to finally get in touch with a human to handle a problem not covered in the automated system. Punching random keys may end up terminating the call. At least chat gets to a person right away – even if the person doesn’t understand the problem or how to do something about it. Also, chat conversations can be saved for later use. first... always select Spanish not English. Most all the systems have a bilingual person to pick up the call. second... always check to see if they have online chat. Every time I have had to deal with a problem, the fastest and easiest solution was through the online chat. Banks, vendors, whatever, the best solution was online chat. Verizon was great. I call TracFone with not getting service on my cell phone. The first person asked questions and ran test, no solution. Second person, same route, then the person talked to a Manager. The manager said I could not use a phone in my area with a SIM card, and to buy a phone without one. I did, problem solved. I was really happy with my experience. To get more personal with person on the other end of the line, I will try to engage them in a conversation about the town they are in. I ask things like, "What should I do when I come visit your city?" Excellent customer support: Navy Federal Credit Union, Cox Cable for TV, Internet & Phone and Consumer Cellular at least in my experience in south east Virginia. My daughter lives in northern Virginia and has had horrible experience with Verizon as does my neighbor across the street. My experience with Dell & HP mirrors most of the other comments, I'd rather get a root canal. I agree with Joe about eBay - they don't care anything for customers and don't care if their top sellers defraud, cheat and lie. We have a local exclusive distributor for one of the world's largest coordinate measuring machine manufacturers. Not only is their customer service virtually non-existent, their reputation is that you have to indicate that you are planning a major purchase to get a response. We pay for an annual software maintenance agreement for support but yet they cannot and will not support the software as they no longer have any employees who even know how to use the software. My most recent contacts asking for quotes for purchases have not even received any replies. Acronis is currently driving me crazy. But the real beauty is LastPass! It took one and a half years before I got to a level 3 dispute and in one email all problems were solved. Before that I was jumping through hoops. The level 3 tech told me that the LastPass download gives you the wrong installation file! He gave me a link to what he called the "binary installation file". When I installed that everything was perfect! To quote my grandmother, "Oy Vay!. One company that has excellent tech support is Dashlane password manager. I had a problem with the manager working with Chrome, and contacted tech support via email. Although it took 2 weeks to solve the problem (don't know if it was Chrome problem or Dashlane's) they worked with me constantly over that period of time offering many different solutions until the problem was solved. If you need a password manager I highly recommend Dashlane. This article explains alot. Lifetime Playon claims they'll DVR online steaming networks. Called tech support because Hulu wouldn't record. 1st of all, I don't use Internet Explorer, Java, And didn't have Adobe Flash installed on my windows 7 computers. Tech support told me IF I enabled and used IE and Flash, Hulu could be recorded. Computer Backup time. This was after a 20 minute wait time. Total support time was about 45 minutes. Needless to say I had my suspicions as to whether their suggestions would work. They didn't. I don't intend to call them again. I dropped Hulu+ with no commercials anyway because they'd switch to online networks for many shows and then forced me to watch commercials. When I could watch those shows without Hulu. Revealing article, Bob. I have had nothing but excellent experience with Tech Support of U.S. corporations like Microsoft and Symantec as well as with Internet service and cellular providers in Israel. I assume that the reason that I never experienced "Tech support rage" is that I do not live in the U.S. Hence, when I called Microsoft Support with really difficult problems, I talked to local computer geeks who were very knowledgeable and liked challenges rather than to someone in India with minimal knowledge and unintelligible accent. 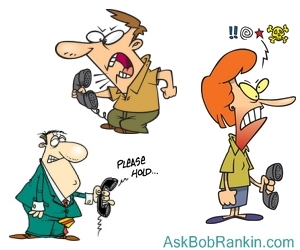 If you call Customer Service and do not get a response from a human after THREE MINUTES, the service provider is required by law to let you leave a phone number and Customer Service has to call you back within three hours. This really works! and it seems the grainier, more broken up, and obnoxious sound you must listen to while waiting...the better the Tech company likes it!!! Hi Bob. Good topic. I try to follow most of your suggestions. One in particular is getting the back up system iDrive and iDrive One. I am not a very techy person but the concept of the iDrive sounded good. My dealings with tech support from iDrive have less than satisfying. They are not very patient with my questions. ( I have Parkinson's Disease and have trouble expressing myself clearly at times which could be the problem) I am looking for a website that will give me step by step in easy to understand instructions. Any suggestions? I recently spent a lot of time trying to exchange an unwanted smartphone from Net10 for a basic telephone as a result of their upgrade to 4G service. I ended up writing a letter to the company. Now I have a basic telephone with my old phone number. Keep on fighting until you get what you need. Their phone reps were very polite but they kept saying they weren't authorized to do what I needed. I can't see a date other than 2016, when this notice was issued but my point is that this must have been known to Microsoft's Tech teams. Answer Tech guys 1 through 7 had no idea as this really is the problem I was / am having. How come Answer Tech guy 8 knows this..........he had done some other remote stuff before he magically found this link. I knew that some Outlook stuff was migrating to other platforms starting end of June 2016, but why do MS allow their customers to have no knowledge of something that will affect how their systems run without making some provision for those of us who are happy with the systems that we have. I simply don't believe that their could not have been a workaround or patch that could have let email users just carry on as they were. You have to be cynical and suggest it is MS gearing up to make more money when they want you to spend, rather than when you might want to upgrade to newer, but not necessarily better, systems. Just to say that because I could not get my mail from the mail icon on the Bing bar, I just went to Outlooklive.com where all my mail is, and just bookmarked it and added it to the favorites bar, and I now have an email icon where I can get my Outlook mail from. Shame none of these people suggested this to me. As you can tell from the article, the problem I have, and I suspect loads of others will have is true, but something tells me that it might be something else, but I have wasted enough of my time , and I would suggest the time of MS's tech teams, so I will just have to live with a non working mail icon on Bing, and an error message on WLM telling me they can't connect to Windows Library Calendar Service, unless of course someone has a solution to this. Bank of America Mastercard. Don't get one. If you have a problem they will go out of their way to discourage you from getting any kind of assistance. A friend of mine made the mistake of getting DirectTV service. She live in the boonies and a satellite dish was the only way for her to get TV. The installer was polite but neglected to bury the cable from the dish to the trailer, didn't bury the pole holding the dish any more than a foot!! In bare dirt!! Plus, she got a used, outdated converter. Several calls to DirectTV got her a headache from hell and it took threats of a lawsuit to get those B@^%$rds to fix things, after six months. There was a incentive to opt for DirectTV that promised a $200 rebate(?) if she opted for certain packages. She's tried to get the money due her OR get rid of the 'prime package' she doesn't want; a sh&#load of BS that I wouldn't look at if you paid me. I listened to her go round-n-round with clueless oblivits who read from a script and promise they'll see to it. 'It' what? Maybe some folks have a good experience with Direct TV - good on them. I wish them a spot in Tech Experience Heaven. G'day. I have had a simple AmericanExpress Green card since 1976. I don't own any credit cards and pay my AX bill at the end of the month, If I can't afford to buy an item by then, I will not buy it until I can afford to pay cash (or AX) for it. In the past 40 years, I would have to say that there has never been one single time that AX CustomerSupport (CS) did not quickly resolve any issue I've had with retailers. My experience may be against all odds and isolated, but these are the types of companies I like doing business with. There are still plenty of fish in the water to gravitate to those companies that provide good CS! Believe it or not, I have received excellent customer service from AT&T on several occasions, but mostly only on issues of billing and changes to my plan. They are less helpful with technical issues. With anything they can possibly attribute to the iPhone itself there is rarely a satisfactory outcome, though occasionally they do come through. There's more reader feedback... See all 54 comments for this article.